In a Wednesday morning stroke of serendipity, some individuals discovered that a Starter Edition of Diablo 3 was made accidentally available for download via their battle.net accounts. Upon discovery of the slip up, Blizzard promptly took battle.net down for maintenance at 8:45am EST. However, those who managed to snag the game before battle.net went dark have reported being able to play through part of the single player campaign without the need of a product key. Gamers who have been enjoying the Starter Edition report that it is indeed D3, but in a more limited form. Accounts by these players suggest it is similar to the content found in the D3 beta. All of the classes are available to play, but the user interface prompts users to upgrade to the full version in order to access certain features. 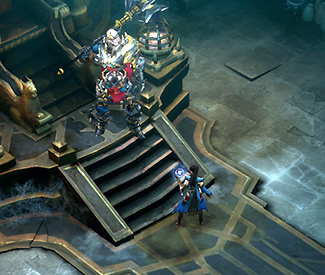 The now-confirmed existence of a D3 Starter Edition coincides with other such watered-down demo versions of popular Blizzard titles, such as StarCraft II and World of Warcraft. For those games, the Starter Edition allows players to enjoy a limited part of the game for free. When upgrading to the full version, the experience is seamless, retaining characters and progress in the demo. Players can probably expect the same treatment for D3 as well. Diablo 3 has been in development for over a decade, so many fans of the franchise were excited to hear Blizzard officially announce a May 15 launch date. Diablo 3 will feature real-money auctions, five distinct hero classes and sport a controversial DRM scheme that will require players to be online in order to play.